McDonald's announced last week that, as of last August, is has stopped using ammonium hydroxide in the production of its hamburgers. 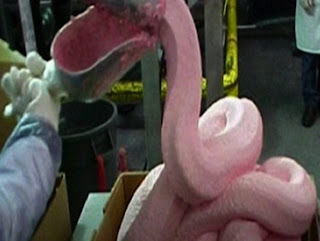 MSNBC reports that the chemical, used in fertilizers, household cleaners and even homemade explosives, was also used to prepare McDonalds' hamburger meat. Propylene glycol: This chemical is very similar to ethylene glycol, a dangerous anti-freeze. This less-toxic cousin prevents products from becoming too solid. Some ice creams have this ingredient; otherwise you'd be eating ice. Carmine: Commonly found in red food coloring, this chemical comes from crushed cochineal, small red beetles that burrow into cacti. Husks of the beetle are ground up and forms the basis for red coloring found in foods ranging from cranberry juice to M&Ms. Shellac: Yes, this chemical used to finish wood products also gives some candies their sheen. It comes from the female Lac beetle. L-cycsteine: This common dough enhancer comes from hair, feathers, hooves and bristles. Lanolin (gum base): Next time you chew on gum, remember this. The goopiness of gum comes from lanolin, oils from sheep's wool that is also used for vitamin D3 supplements. Silicon dioxide: Nothing weird about eating sand, right? This anti-caking agent is found in many foods including shredded cheese and fast food chili. "At the beginning of 2011, we made a decision to discontinue the use of ammonia-treated beef in our hamburgers. This product has been out of our supply chain since August of last year. This decision was a result of our efforts to align our global standards for how we source beef around the world." The U.S. Agriculture Department classifies the chemical as "generally recognized as safe." McDonald's says they stopped using the chemical months ago and deny the move came after a public campaign against ammonium hydroxide by celebrity chef Jamie Oliver. Thank you for sharing this very enlightening information. We as a people perish from our financing of eating habits that are detrimental to our health. Through lack of knowledge and in many cases a lack of desire to gain wisdom and understanding through reading, attending seminars on well being, etc.